The new Deep Cut Band Saws deliver 2X more durability, best-in-class power at 11 Amps, revolutionary cut visibility and the industry’s largest cut capacity at 5" by 5". 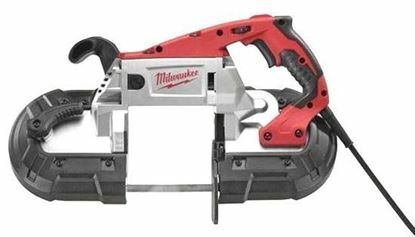 These Band Saws still deliver on the heritage of long-term reliability and performance that make Milwaukee Band Saws the standard in industrial metalworking, but now feature a new, exclusive Job Site Armor™ Technology and all metal direct drive system that provide game-changing durability. The Job Site Armor™ Technology is made of a proprietary composite material and has crush zone barriers that provide long lasting rugged protection. The all metal direct drive gearing system delivers maximum tool life, while requiring less servicing than a chain drive. In addition, a gear protecting clutch extends gear and motor life by absorbing high impact forces caused by blade lock-ups. The new Band Saw's slimmer motor housing increases user line of site delivering superior cut accuracy and revolutionary cut visibility, while a new balanced body design allows tool to rest naturally and comfortably in users hands. At 14.5 Lbs., this lighter weight design delivers more control over the tool and less fatigue at the conclusion of the work day. Other innovative features include a tool-free locking adjustable shoe for a button actuated tool-free design that allows user to quickly adjust from an extended shoe to no shoe in seconds, while the new debris protection system delivers longer pulley life by removing debris during use.